Sometimes you need an author that will jolt you out of your spiritual lethargy. 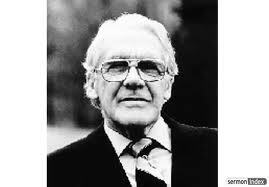 Leonard Ravenhill will never fail you at such a time. I’m thinking now of 2 of my favorite Ravenhill titles: Why Revival Tarries and Sodom Had No Bible. In Why Revival Tarries there are 20 chapters with a page of fantastic quotes at the beginning of each chapter. Imagine being a preacher as I am and being hit with:One does not need to be spiritual to preach, that is, to make and deliver sermons of homiletical perfection and exegetical exactitude…Preaching of the type mentioned affects men: prayer affects God. Preaching affects time; prayer affects eternity. No man is greater than his prayer life. The pastor who is not praying is playing; the people who are not praying are straying. Yes he is eminently quotable, likes a rhyme, yet is never corny. I could provide many other great quotes, but I am far too slow a typist to reproduce the entire book here. It is still in print and can be picked up at christianbook.com for $8.99. The answer to the question of why revival tarries has much, I came to see, to do with me.